The Arden community is built along 176 acres of lakes, the largest of which is the beautiful Arden Lake. While most people living in the area have to go for a drive to enjoy all the benefits of a lake, Arden’s residents can simply take a leisurely stroll to reach the sparkling body of water at the center of the community. Living along Arden Lake offers convenient access to all the fun activities and opportunities people normally associate with a day at the lake. Get healthier with hiking trails that include a lake view. Arden Lake is entirely surrounded by hiking trails. Residents can run a full 5k around the lake without ever losing sight of the gorgeous waterfront. If you prefer to venture more into areas surrounded by trees and other greenery, the community includes over 19 miles of trails and 30 acres of parks you can take advantage of as well. Keep an eye out for wildlife while enjoying beautiful surroundings. One advantage of living near a large body of water like Arden Lake is that it attracts wildlife as well as people. The lake provides opportunities for residents to enjoy nature while watching for local wildlife. There’s even a charming footbridge you can follow to reach an island with a gazebo and observation area designed just for that purpose. Go fishing in your own neighborhood. Arden’s fishing areas are within walking or biking distance of every home in the community. If you like the idea of spending a day fishing now and then, living within close proximity of a lake puts the dream within easy reach. 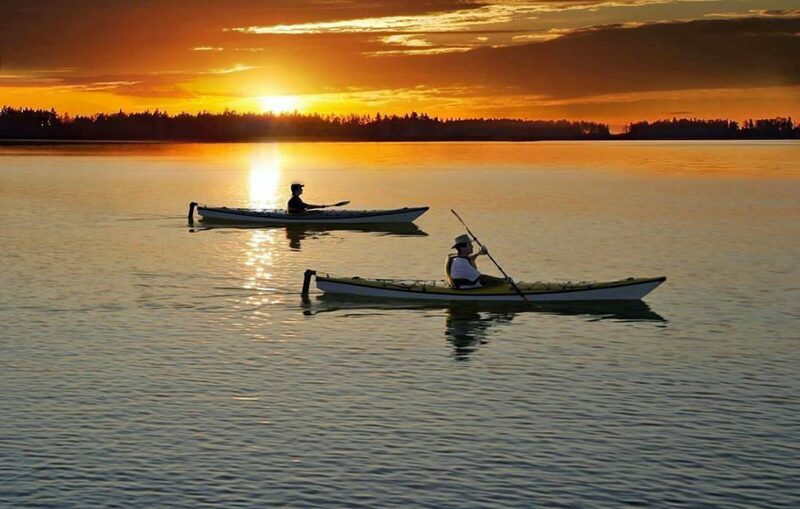 Spend a day on the water in a canoe, kayak, or electric boat. There’s nothing quite like spending a day on the water. The Arden community will offer boat ramps and launch locations that residents can use when boating in canoes, kayaks, or small electric boats. Enjoy the relaxing lull of the lake’s waves and the view of being surrounded on all sides by the beautiful blue of water. Have an excuse to spend more time in nature. Most of us know we’d be happier if we spent more time in nature, but just find it difficult to get out to parks, lakes and hiking trails regularly enough to do so. When you live in a community with a big, beautiful lake such as Arden Lake, you won’t be able to find a reason not to go outside. You can step out your front door and find yourself within a short walk of all the benefits Arden Lake has to offer. To learn more about Arden and its amazing amenities, join our Founders Club and be the first to receive updates and invites to upcoming events.